A .pdf version of the article can be downloaded here. MAP students are just back from a second fieldwork session in Horsea lake, Portsmouth, UK. 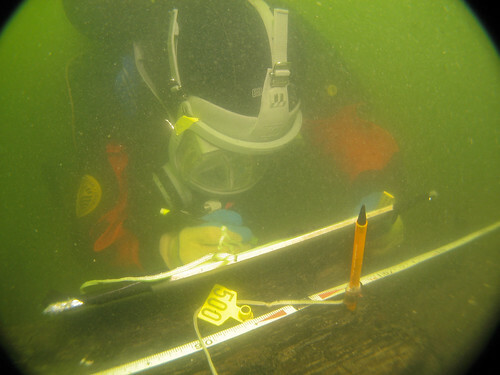 The diving fieldwork was part of the Gresham Wreck Hull Study Programme and focussed on finishing the on-site recording of the so called Gresham Wreck, a 16th century merchantman which has been deposited in the brackish lake (see the project page for more detail). Students recorded surface detail on one of the wreck sections and partly disassembled the bow of the vessel to understand the construction. On 7th July, the MAP team was visited by participants of the IKUWA conference fieldschool who also dived the wreck. See pictures from the survey on our Flickr page. The Maritime Archaeology Programme would like to thank the friendly personnel of the Defence Diving School in Portsmouth for their support. 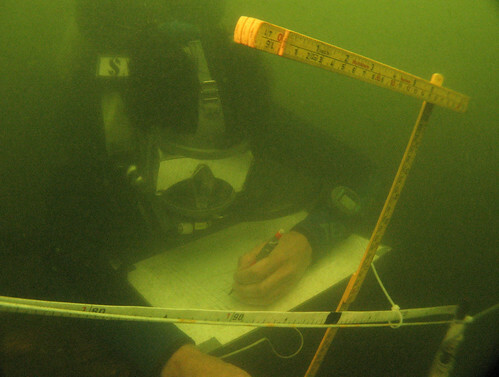 In August 2007, the Maritime Archaeology Programme spent a first fieldwork session on the Gresham wreck in Horsea lake in Portsmouth. The aim was to re-tag the wreck timbers with new, longer lasting tags and stainless steel nails and to record sections through remaining wreck structures in order to supplement previously acquired total station data. The MAP team of two students and two lecturers was supported by a diver from the British Museum. Using commercial SCUBA equipment with surface communication facilities, all planned tasks could be completed in five diving days. All framing timbers were marked with new timber tags. Sections were recorded with vertical offsets from a tape measure running along each frame. The data was processed by MAP students and added to the project archive. Pictures from the diving fieldwork can be found on our Flickr page.